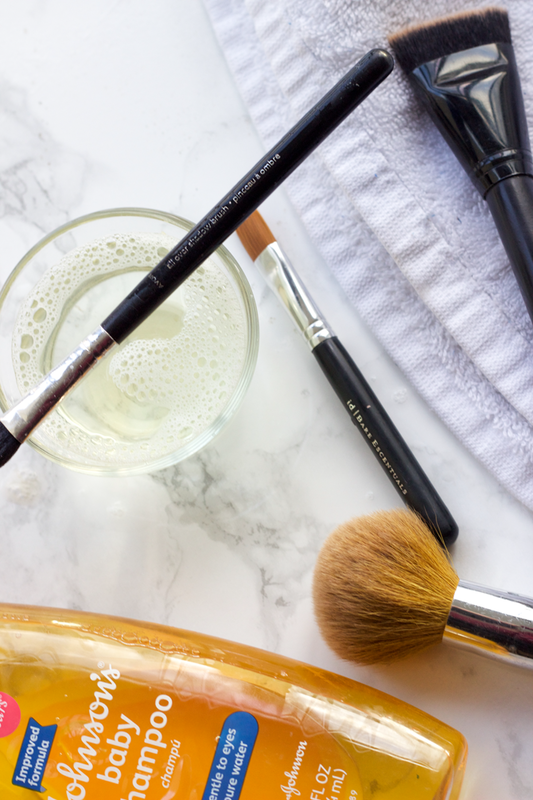 How often do you wash your makeup brushes? Before you answer, I invite you can enter the trust circle. Truthfully, I try to wash mine once a month with try being the operative word here. No judging, okay? We’re in the trust circle! Whenever I’m home I always use my mom’s brushes because they are soft and apply make up so well. I was under the impression that was because she just had nicer brushes than I did (isn’t all mom stuff nicer than your own?) but she just takes better care of her brushes than I do. In fact, we have many of the same exact brushes! Her secret? She washes them once a week! Aint no body got time for that. Oh wait, but I do. Most Sundays, I try to wrap up the weekend with a face mask or some sort of hair treatment and a cup of tea to wind down before the work week starts. And those 20 minutes are the perfect time to wash my make up brushes, too! 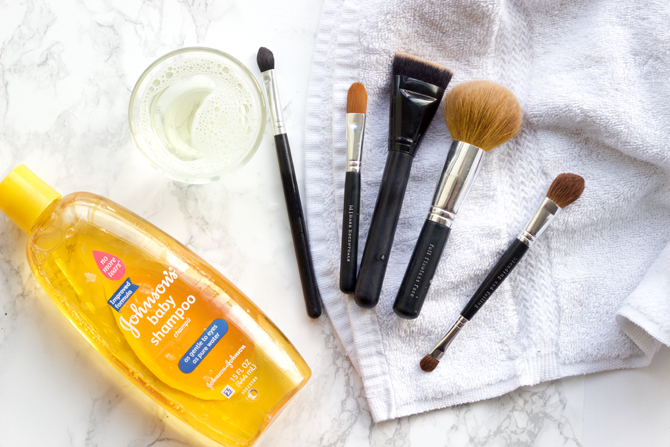 It is so darn easy to wash your brushes, too. 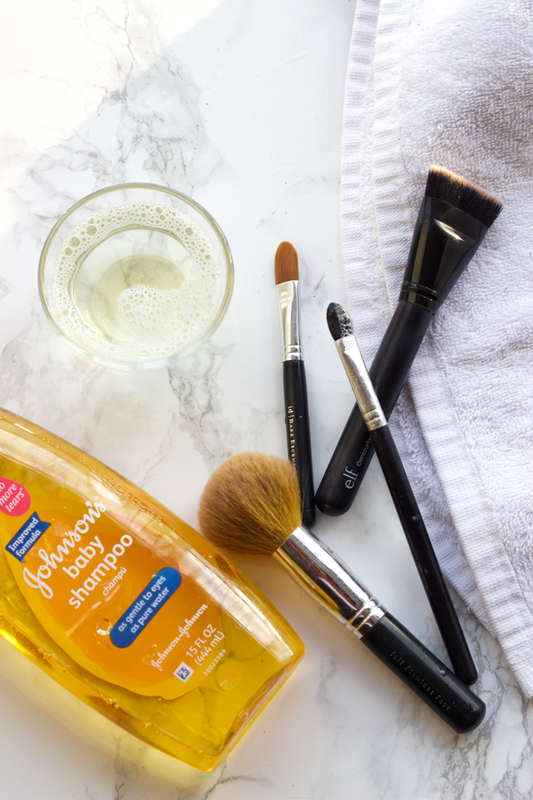 You could use a proper brush cleaner or a gentle baby shampoo also does the trick. I’ve also heard Dove soaps or even Dawn dish soap work really well, too. 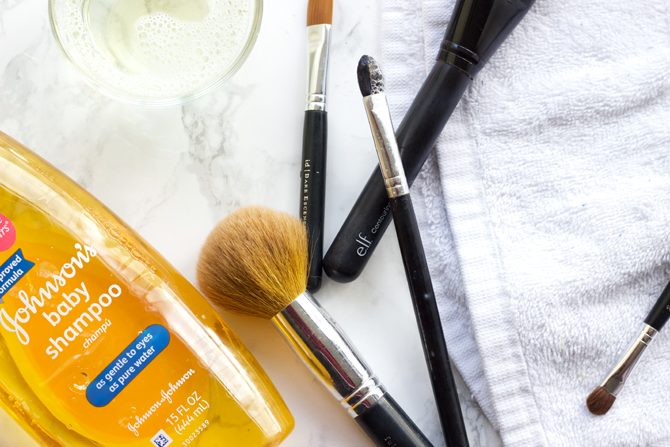 For that tough to scrub concealer or super built up product, try olive oil. For my preferred method of baby shampoo I…. Run under warm water again until the water runs clear. And that's it! Easy, right? It takes less than 20 minutes which is the perfect amount of time for a face mask and a cup of tea. And trust me, it makes all the difference in your makeup application and will extend the lifetime of your brushes. Good care is worth it! A note about drying the brushes: I try to leave my brushes flat or faced downwards to dry. You don't want to leave them upright to dry or the moisture may get into the ferrule which will loosen the bristles. Thank you for sharing this! I'll have to try to wash my brushes like this.